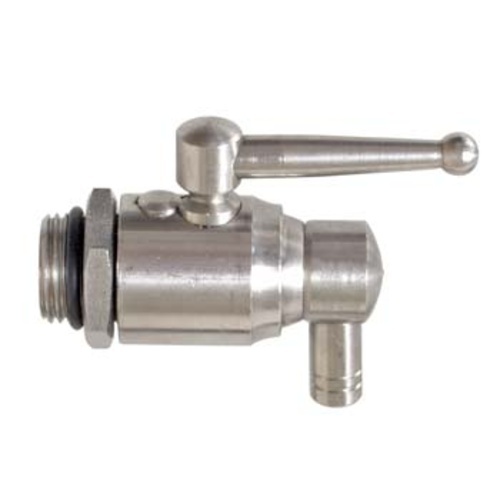 A stainless steel ball valve for use with our WE720 and WE722 50L and 100L Fusti Tanks. Seals against the tank with a gasket. Outlet 3/8" barb swivels for easy use. Easy way to drain the tank to top off barrels. Product is great but the company won't leave me alone! I am continuously being contacted with new offers! I am not brewing or fermenting, I am using the fusty tank and valve for my water storage system in my off-grid school bus/tiny home conversion. Please stop sending me mail and emails! Otherwise, both products are high quality and excellent. Replaced my large standard Speigel tank valve so my 110 liter tank could fit in my freezer for cold stabilizing my wines. Worked well for bottling too.